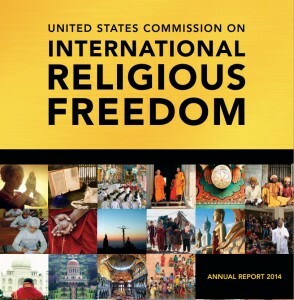 Last week the State Department released its International Religious Freedom Report for 2014. A major concern addressed in this year’s report is the violent opposition to religious freedom, including the persecution of Christians. Here are nine things you should know about the persecution being faced by our brothers and sisters in Christ around the globe. 1. China: Authorities in China continued to restrict the free printing and distribution of religious materials. The government limited distribution of Bibles to TSPM/Chinese Christian Council entities such as churches, church bookshops, and seminaries. Individuals could not order Bibles directly from publishing houses. Members of unregistered churches reported the supply and distribution of Bibles was inadequate, particularly in rural locations. There were approximately 600 Christian titles legally in circulation. According to a foreign Christian source, in the last 10 years an estimated 200 Christian bookstores and nine domestic Christian publishers had opened in the country. Authorities in Zhejiang Province also ordered the destruction of hundreds of Christian churches and crosses as part of a campaign to demolish illegal structures. 2. Iraq: Christian leaders estimate there are approximately 400,000-500,000 Christians in Iraq (a significant decline over the last 10 years from a pre-2002 estimate of 800,000-1.4 million), including approximately 5,000 evangelicals. Christians in the country face persecution from both the government and terrorist groups. Some evangelical groups chose not to register with the government, despite requirements to do so to operate legally. They reported they preferred to avoid increased government scrutiny of their internal operations, and to avoid regulations for registration that indirectly constrained proselytization. And many Christians have been subjected to killings, forced conversion, threats of violence, and intimidation by Islamic State (ISIL). 3. Iran: In Iran, Muslim converts to Christianity faced harassment, arrest, and jailing. Numerous Christians remained imprisoned and prison authorities reportedly withheld proper medical care from some Christian prisoners. On April 17, a prison guard reportedly broke Christian convert Farshid Fathi’s foot by stomping on it during a cell inspection in Evin Prison. Authorities reportedly then prevented Fathi from visiting a hospital for three days. Christians, particularly evangelicals, continued to experience disproportionate levels of arrests and high levels of harassment and surveillance. The status of many of these cases was not known at year’s end. Authorities released some Christians almost immediately upon detention, but held others in secret locations without access to attorneys. The United Nations Special Rapporteur for Human Rights in Iran reported in October that authorities held at least 49 Protestant Christians in custody, many for involvement in informal house churches. 4. Nigeria: Christian groups said they faced difficulty obtaining government employment or permits to construct churches in many northern parts of Nigeria. The terrorist organization Boko Haram has also killed thousands in both indiscriminate acts of violence and deliberate attacks targeting Christians. On April 14, Boko Haram kidnapped more than 200 mostly Christian girls taking exams at the Government Girls’ Secondary School in Chibok, in Borno State. Boko Haram released a video in which its leader Abubakar Shekau said he would sell the girls into slavery and several of the girls stated they had converted to Islam. Other women whom Boko Haram had abducted later reported they were forced to convert in order to legitimize their “marriage” to their captors, and those who refused to convert were subjected to physical abuse, sexual abuse, forced marriage, and forced labor. 5. North Korea: Although the UN estimates there are between 200,000 and 400,000 Christians in North Korea, no Protestant or Catholic churches officially exist in the country except in the capital Pyongyang. In Pyongyang there were four state-controlled Christian churches: two Protestant churches, a Catholic church, and Holy Trinity Russian Orthodox Church. The number of congregants regularly worshiping at these churches is unknown, and numerous defectors from outside of Pyongyang reported no knowledge of these churches. The report notes that the North Korean government continued to deal harshly with those who engaged in almost any religious practices through executions, torture, beatings, and arrests. 6. Sri Lanka: In Sri Lanka, local police and government officials sometimes appeared to be acting in concert with Buddhist nationalist organizations to attack members of religious minorities. On January 12, a Buddhist mob attacked two evangelical churches in the southern town of Hikkaduwa during services, causing thousands of dollars of damage, burning Bibles, breaking windows, and smashing musical instruments. A film of the attack showed police standing idly by while protesters continued their acts of destruction. In addition to church attacks, evangelical churches reported increased pressure and harassment by local government bodies to suspend worship activities as “unauthorized gatherings” or close down if they were not registered with the government, despite no legal requirement to do so. 7. Sudan: In May a local court in Sudan sentenced Meriam Yahia Ibrahim Ishag to 100 lashes and death by hanging for allegedly committing apostasy and adultery by marrying a Christian man. Ishag said she had been raised as Christian and identified as such. Following significant international pressure, a higher court overturned the sentence in June, but Ishag was not allowed to depart the country until a month later. Most individuals charged with apostasy recanted their non-Islamic faith or fled the country to escape harsh penalties, including death. The government also continued to deny permits for the construction of new churches, detain church members, close or demolish pre-existing churches, restrict non-Muslim religious groups and missionaries from operating or entering the country, censor religious materials and leaders, and arrest or intimidate suspected proselytizers. 8. Syria: In Syria, ISIL required Christians to convert, flee, pay a special tax, or face execution in territory it controls, and systematically destroyed churches and other religious sites. Some Christians reported societal tolerance for Christians dwindled as the influence of extremist groups increased, triggering the flight of many Christians from the country as refugees or into Kurdish and regime-controlled areas. Christian groups constituted 10 percent of the population before the civil war, although the Christian population may have been reduced to less than 8 percent as Christians continue to flee the country. 9. Ukraine: On May 14, the Donetsk and Luhansk People’s Republics (“DPR” and “LPR”) adopted its “constitution” declaring the “Christian Orthodox faith…practiced by the Russian Orthodox Church (Moscow Patriarchate)” as the “primary and dominant” faith in the DPR. Since the beginning of the separatist movement in the Donetsk and Luhansk Oblasts, separatists were responsible for killings, beatings, and kidnappings of Protestants, Catholics, and Ukrainian Orthodox Church clergy and adherents. On July 8, leaders of Evangelical Protestant Churches of Ukraine issued a statement saying that “targeted attacks by armed DPR and LPR militants” against evangelical believers involved abduction, beating, torture, murder threats, and damage to houses of worship, seizure of religious buildings, and damage to health and private property of the clergy. The next day DPR gunmen seized the campus of the Donetsk Christian University, which had been run by the Baptists Union, threatening to “court martial” those who protested against the takeover. Joe Carter is an editor for The Gospel Coalition, author of The Life and Faith Field Guide for Parents, the editor of the NIV Lifehacks Bible, and the co-author of How to Argue Like Jesus: Learning Persuasion from History’s Greatest Communicator. He serves as an elder at Grace Hill Church in Herndon, Virginia. You can follow him on Twitter.